Here you go! Another OE and I hope your students enjoy the song and the exercise! useful online activities to practice some science contents. In addition, children can improve their listening skills. The Killers- Are we human? 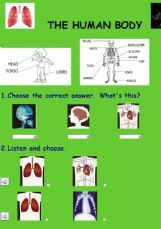 This is a multiple choice very easy activity for elementary students. I use it with 6th graders (11-12 years old). They love the song as Bar�a�s coach, Guardiola, used to listen to it with the whole team. Enjoy it! Words connected with appearance, bpth people and animals. 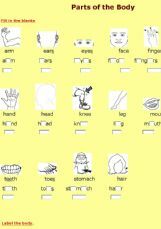 This is an exercise to accompany my worksheet that is available for download on the ESL printables site. 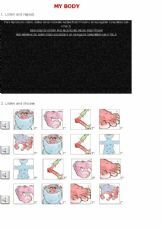 Students are required to select the name of the body part from a drop down menu. I put all my effort on this exercise, I really hope you enjoy it! 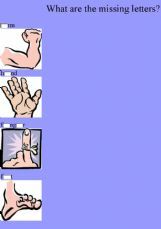 Three exercises and a song about body parts.